Renewable green energy in the form of wind, solar or tidal power has the very great potential of providing one quarter of all U.K. daily electricity requirements. This target was attained on a number of summer days in 2017, with the great advantage of a big reduction in the burning of fossil fuels. The U.K. is well ahead of most countries in the number of onshore and offshore wind farms, with the planning process for offshore wind farms (OWF) easier to procure in British shallow coastal waters. It is now two decades since the installation of the first U.K. offshore wind farm, and the U.K. now has the largest OWF in the world in the London Array in the outer Thames Estuary of 175 turbines and 630 megawatts of power. The top dozen U.K. OWFs all generate power outputs of between 300 megawatts and 600 megawatts of electricity. There are now eighty OWFs in commission, under construction or in the planning process for U.K. coastal waters. Germany has the 97 turbine 582 megawatt Gode Wind Farm to the north west of Norderney in the North Sea, Holland has the 150 turbine 600 megawatt Gemini Wind Farm to the north of the Frisian Islands, and Denmark has the 111 turbine 400 megawatt Anholt Wind Farm in the Kattegat near Anholt Island, as well as other wind farms off Esbjerg. 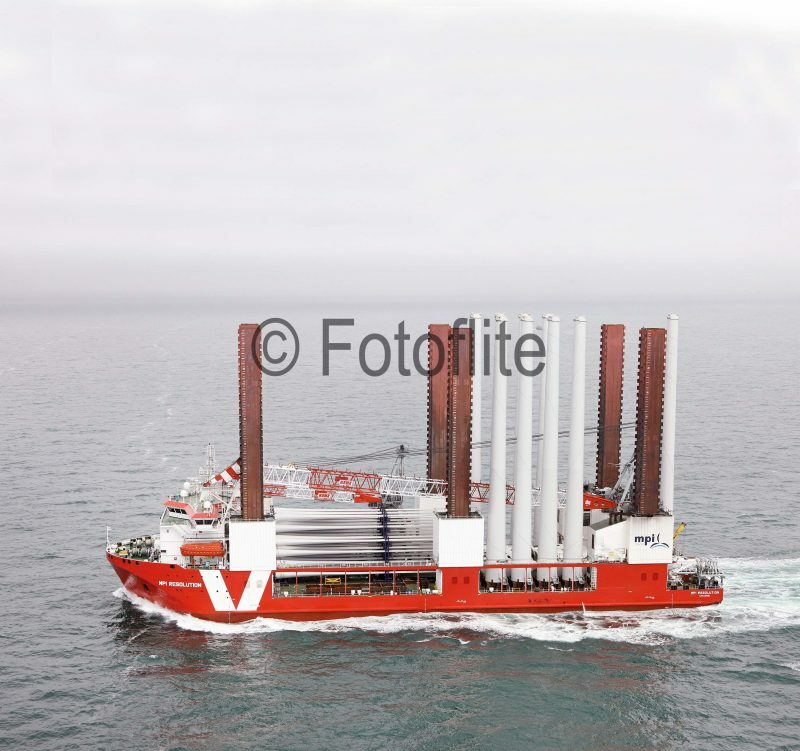 Wind turbine installation vessels (WTIV) are now common sights around all U.K. coasts, with offshore wind farms concentrated in the shallow coastal waters of the East Coast or the Irish Sea. 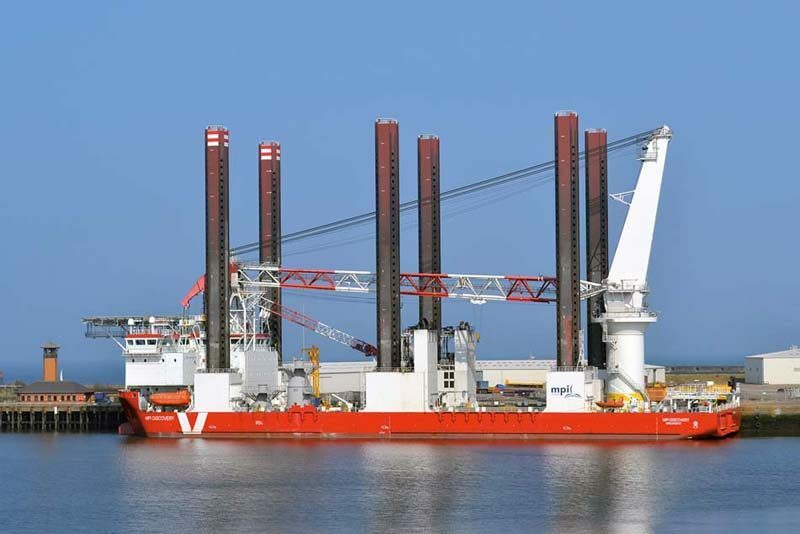 A WTIV is specially designed for the positioning and setting up of offshore wind turbines, and has borrowed the jack-up technology of the offshore oil industry as regards self elevation. It is self propelled to enable fast relocation to the next wind farm, and has a well designed hull of sufficient width to carry multiple foundations, towers, nacelles and blades. Azimuth propellers with DP2 positioning computer systems are used to accurately position the vessel during the jack-up operation. The long wind turbine towers of length eighty metres are usually transported by the WTIV in the upright position and bolted to a vertical stay in order to ease the lifting of towers of up to one hundred metres in height to fit into the yellow Transition Pieces (TP) already sunk into foundations or monopiles on the seabed. Foundation monopiles typically weigh 800 tonnes, towers can weigh 300 tonnes, nacelles can weigh 330 tonnes, and blades or rotors can weigh 150 tonnes with a 126 metre diameter. The WTIV operations are thus essentially heavy lift operations performed during calm weather windows in shallow waters with legs planted firmly into the seabed. Sheerleg and jack-up barges and other similar craft were used at first before the lack of WTIVs was remedied from 2003 onwards. This was the first U.K. WTIV and was named after the collier brig of Capt. James Cook that he used in his later world exploration voyages. She jacked-up her initially white painted hull on her six legs between three metres (ten feet) and 46 metres (151 feet) above the sea. She was launched in 2003 at the Shanhaiguan yard in Qinhuangdao in China (Yard number TIV1) and was completed in November of that year for Mayflower Energy Ltd. and is registered at Douglas in the Isle of Man. She has dimensions of length 130.5 metres, moulded beam of 38.0 metres and depth of 8.0 metres with a draft of 4.0 metres. She is powered by four Mitsubishi sixteen cylinder four stroke oil engines driving four generators, each of 1,824 kW and connected to four electric motors, each of 1,500 kW, and four Aquamaster azimuth thrusters for propulsion and steering to give a total power output of 9,000 bhp and a service speed of 10.5 knots. She is also equipped with three 700 kW Kamewa bow thrusters for accurate positioning of the vessel in conjunction with her Kongsberg Simrod SDP11 dynamic positioning computer control system. There is a manual override for this system using an independent joystick control system in the event of the computer system becoming inoperable. 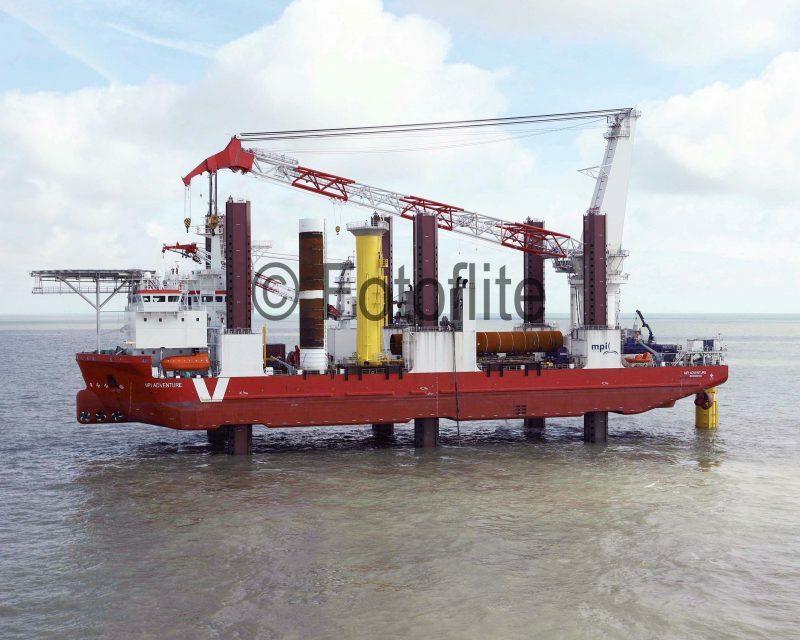 Mayflower Resolution has a height of 226.2 feet at a draft of 9.5 feet, with a maximum payload of 8,950 tonnes, 3,800 square yards of cargo area, and one pedestal mounted rope luffing electric/hydraulic crane of 300 tonnes capacity at 25.5 metre radius, with another crane of fifty tonnes capacity at a radius of 35 metres. She has a ballast capacity of 8,832 cubic metres in thirteen tanks, with twin two speed ballast pumps of one thousand cubic metres per hour capacity. She has a cylinder type jacking system with each leg handled by four primary and four secondary cylinders. These are retained in position by catch beams, which are housed in catch beam rings attached to the jacking cylinders. The jacking system elevating capacity is 2,500 tonnes per leg and the holding capacity is 5,000 tonnes per leg. Mayflower Resolution was the first and largest WTIV in service and was designed by the Knud E. Hansen (KEH) practice of Denmark with her construction supervised by Graig Shipping of Cardiff, and she is known as the ‘mother of all WTIVs’. She is equipped with the very latest dual radar systems, VHF systems, Inmarsat B and C communications systems, independent Sperry autopilot and echosounder, Litton water speed Doppler log unit, and two independent GPS systems to constantly monitor her position. She has a gross tonnage of 14,310 and cost £53 million to build, although her contract price was £20 million, which was exceeded by £10 million by the shipyard, with a further £23 million spent in adding an ROV (Remotely Operated Vehicle) system to enable her to lay undersea cables as well as install wind turbines. She has a crew of 34 with the turbine erection team of 36 people swelling her complement to seventy persons, all housed in single cabins. The delivery voyage of Mayflower Resolution took 66 days from China to Falmouth, and she underwent trials in Falmouth Bay, where she was tested for the first time. She was then put to work in February 2004 installing wind turbines at the North Hoyle wind farm on the East Coast for turbine maker Vectis and National Wind Farms, a consortium of Centrica and PowerGen. This contract ended on 23rd March 2004 and she sailed for the Tees and arrived on 30th March. 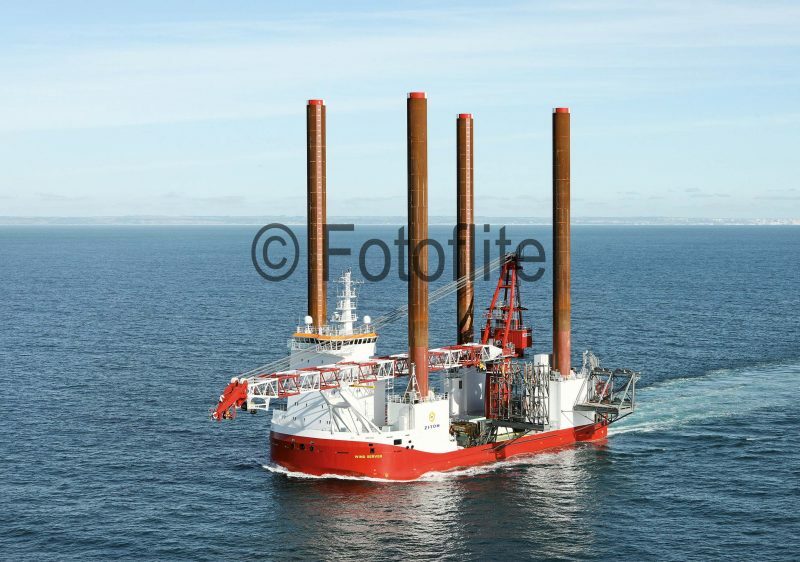 She was due to depart from the Tees on 8th April for Great Yarmouth to install turbines for the Scroby Sands wind farm, but the Mayflower parent company went into liquidation on 31st March with debts of £17.7 million. Deloitte were appointed as administrators and eventually sold her for £12 million to MPI Offshore Ltd. based in Stokesley, North Yorkshire. Mayflower Resolution was then laid up at South Bank on the Tees at times between installation work and became a very familiar sight with her white hull and six tall legs on Teesside.